4 Simple Winter Home Decor Ideas to Make Your Living Room Cozy This Winter! It seems winter is sweeping over the United States which means most of us (children excepted) would rather be inside where it is warm and cozy. I have found 4 simple winter home decor ideas to make your living room feel warm, safe, cozy and snuggly! I have found that a very simple but quite effective way to make a living room comfy warm is with candles. There are many kinds of candles to choose from. There are candles in all different sizes, shapes, and scents. Not only do candles add soft light to our home décor, but they also add tantalizing aromas which can affect our moods. How about an aromatherapy candle to help us feel better. And of course there are those candles that bring back childhood memories — there is nothing like a deliciously scented apple cinnamon candle to warm up your living room on a cold winter day! Inspired by ancient oil lamps found in archaeological digs, this design by Erik Hertz brings the appeal of handmade pottery to light. The design was also inspired by necessity: Erik lives in a part of Maryland where electricity outages are frequent, so he developed this glazed stoneware “candle” as backup lighting for his studio. It includes a fiberglass wick that won’t deteriorate and smolder like cotton. Simply fill it with liquid Paraffin for a clean-burning alternative to smoky candles and spotty electrical service. Add a few drops of your favorite essential oil for a more aromatic experience. Handmade in Melbourne Beach, Florida. Has a 5 star review. $32.00. Beautiful hand-hammered naturalistic detail! This is a stunning example of blacksmithing as a true art. Each pine cone and needle is hand forged. This makes a great gift, too. Dimensions: Overall Size: 14 in. W x 5 in. D x 3.5 in. H; Weight: 3 lbs. “Decorative pillows serve a dual purpose. They often have fancy cover material which serves to decorate the room where they are found. Since decorative textiles are commonly 54 inches in width, many decorative pillows finish about 17×17 inches. (54/3 = 18 less seam allowance) When used to decorate a fully made up bed, decorative pillows are likely thrown aside at bedtime, since they are not covered with a washable pillow case, thus, while found on the bed, they are primarily there for decoration, hence they fall under this category. These pillows may be custom made, as well as made by freelancers. Decorative pillows are also found on furnishings in more public parts of the home, such as sofas, chairs and window seats. Here, their common use may overlap both orthopedic and bed pillows. For example, unless a person has some particular medical condition, they will likely use a handy decorative pillow for lumbar support, as needed, while seated on a sofa. Likewise, for the occasional nap, decorative pillows are handy for supporting the head or neck, even though they may not be covered with a pillow case, as are bed pillows. There are five common synonyms for decorative pillows which are descriptive of their use in the home. “Accent” pillows emphasize or accent some other part of the home decor. The terms “sofa pillow” and “couch pillow” refer to the place these decorative pillows are likely found. The terms “toss pillow” and “throw pillow” may refer to the way they generally arrive in their place. Novelty pillows are shaped like humorous objects (a banana, tweety bird, a human leg, a chainsaw, a dill pickle, a former president) and are meant to brighten up and add humor to a room or lounge area. Tent-flap pillows are placed at the front of a stack of pillows decorating a bed. “Tent flap” is the term used to describe a separate flap of fabric that is attached at the top of the pillow and folds down over the face. The tent flap can be loose or tacked down; if the flap is loose a decorative tassel or bead is usually used to weigh the flap down so it hangs properly. Our Laura Megroz candy heart pillow keeps the season’s sentiments alive all year. Fun and refined, artist Laura Megroz celebrates the Valentine spirit in a candy heart pillow of hook rug wool and cotton velveteen. Zipper closure. Polyester fiberfill. Spot clean. Imported. Exclusive. 18″W x 18″H. Internet Exclusive. $85.00 and 5 star review. For me, when I have a minute to relax on the sofa, I enjoy cuddling in with a decorative pillow! I crochet so needless to say I have many afghans and honestly, I don’t know how anyone can “snuggle in” on a cold winter’s night without one! What I know about afghans is that they are considered blankets which are made by knitting or crocheting with wool, cotton, linen (or other kinds of natural materials), or made of a type of man-made material. Afghans are also commonly referred to as “throws.” Sometimes they are used as bedspreads or as a decorative piece placed on the back of a chair. Earth Spirit Throw Blanket by Denali Home Collection brings a new level of warmth and softness to your home in a unique and stunning Native American design. The Earthspirit double sided throw blanket features a rustic print in brilliant red, brown, and taupe on one side and solid taupe on the reverse side. The edge of the throw is detailed with a coordinating blanket stitch. A perfect home accessory, this blanket throw is water resistant, colorfast, and stain, odor and mildew resistant. Generously oversized at 60 inches x 70 inches, the blanket throw is made of 100 percent acrylic microplush and, for easy care, is completely machine washable and tumble dry. Enjoy the combination of lightweight warmth and rich color and style with the Denali Earthspirit Throw Blanket. Adds a beautiful, distinctive rustic touch to any setting. Size – 60 in. x 70 in. Created and designed in Wisconsin. Manufactured and sewn in the USA, either Wisconsin or North Carolina. There are many, many sizes, colors, shapes and designs. Whatever one you may choose, there can be nothing nicer this winter than to curl up in your favorite chair in the evening with a good book, a cup of tea, and a beautiful afghan! Tuscany is the perfect quilted throw for a new solid look. The decorative stitch pattern pairs easily with your existing decor and will sure to add a new decorative element with the beautiful scalloped edges. This quilted throw is filled with cotton filling and features a polyester microfiber fabrication on the face and the reverse. Its prewash finish gives a worn in appearance to this decorative throw. Only $34.99. Size: 60 in. x 72 in. 1 Throw: 60 in. x 72 in. I have been standing at my front window looking out at “white.” Snow has been on the ground for a while now, very cold temperatures, and the trees are sleeping. So I decided that since I can’t go outside the best thing to do is bring the outside in! Greenery! Silk greenery can bring that feeling of nature inside and can also make us imagine a springlike day when the weather is warm! Specifications: Height: 15 In., Width: 17.5 In., Depth: 10 In., Pot Size: W: 11 in, H: 2.5 in, D: 6.5 in. $69.99. Here’s a classic look that is sure to please even the most discerning eye. We’ve taken an array of beautiful flowers (in varying degrees of bloom), mixed them with lush green leaves, and package it all in a stunning, classic Whitewash planter. It’s the all-time classic, and it will stay looking fresh for years. Makes an ideal gift as well. Specifications: Height: 17 In., Width: 20 In., Depth: 15 In., Pot Size: H: 5 In. W: 11 In. D: 6.75 In. $129.99. I hope you have enjoyed some of my winter home decor ideas! Also check out my post on quick and easy winter home decor fixes for your master bedroom! I love, love, love having candles lit around my living space during the colder months. Even though it’s cold outside, it makes everything more cozy. 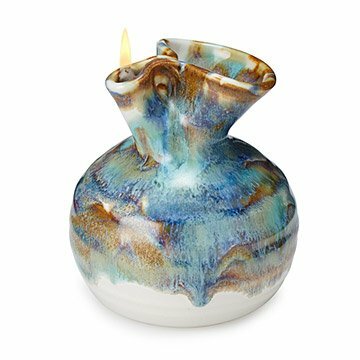 I really like the looks of the stoneware candle with the liquid Paraffin. Does it have a lid to prevent spilling if (when) my boys get rowdy and bump it? And, how long does one filling last? I’ve never tried a liquid wax type candle before. Hi Angie and thanks for your comment! The pottery candle does not have a lid but to me the way it is shaped would make it difficult to fall over. I did some checking on the liquid paraffin and found out that it is an excellent alternative to a tea light. Since paraffin fuel is smokeless, you won’t be disturbed by unpleasant fumes or smoke. Plus, you won’t have to deal with messy drippings from melted wax when you use liquid paraffin oil. Liquid paraffin offer hours of burn time and lasts longer than traditional candles and tea lights, which means they won’t have to be replaced as often! I hope you come back and visit soon! The mixed floral arrangement in the whitewash planter just might be the answer I was looking for. I have four cats too — Morris, Cali, Samson and Josie! I certainly understand and agree that silk arrangements are a much safer and beautiful alternative to live plants! I hope you get one and try it and please let me know how you like them. Thanks for your comment and please come back to visit! Hi Brenda, I love the tips you have given on how to make a living room cozy in winter. I love staying outdoors but when winter arrives, one is forced to stay indoors and the only way to enjoy your home this period is to make it cozy and comfortable. I love the Pottery candle and Mixed Floral Arrangement w/White Wash Planter best. Those two will surely make a living room cozy. I’m an outdoor person myself and have a tendency to hibernate during the winter months so I MUST have a cozy environment to hibernate in! Thanks for your comment and I hope you visit again and often! I’ve been wanting to do something with my living room to make it feel more homey. You have given me some great ideas. And this is an inexpensive way too. I don’t need to go spend too much money to add a little more warmth to my home. I don’t even have to go all out with redecorating. Just a few items placed here and there will do the job. I am so glad you liked it! I agree that you don’t have to spend much to get an entirely new feel to a room! I think it’s important to do a few simple things for comfort and relaxation and I can see you agree. Thanks again! It is cold, cold, cold outdoors! So cold I don’t light a fire in my fireplace anymore because too much cold air comes in when it is dying down and cooling after I enjoy the warmth. So now I have three candle holders with big fat candles that I light. It works so well to give the warm feelings of a fire without having to open the flue! I love the idea of the liquid stone ware candles. Definitely something to check out! Afghans are a staple here in the NE, too, for my house. One of the first items that come out when the leaves begin to turn. So cozy and they last for years and years! Hi Annie! Yes, it is very, very cold! I’m glad you are enjoying candles and the liquid stoneware candles are a great alternative to the “traditional” candles as they last longer! And I’m so happy you are an afghan fan! I hope you come back soon to visit and thanks for your comment! Next Post Magnificent Pottery Pieces at Decor By Hand!